Lately I have become a little addicted to making (and wearing) colored pencil jewelry. The items pictured are really easy to make and only require a few basic tools. You don’t even need to buy any materials, simply chop a few centimeters from the end of your kids crayons…if you do this neatly then they will be none the wiser!! I think the results look great and you, or your child, will definitely stand out from the crowd wearing them! 1. For the basic necklace you will need to begin by making your beads. 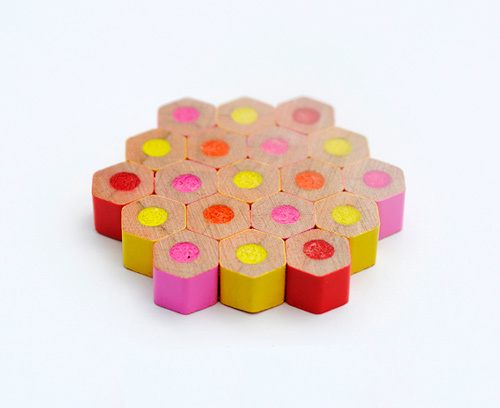 You can use either hexagonal or round crayons. The beads I cut were 7mm long. To cut your beads use a small, sharp, hacksaw blade. (In the UK you can pick up a junior hacksaw for a pound or two in most hardware shops). Take your time when cutting the crayons and try not to apply too much pressure…that way you are less likely to chip the paint off the outside. 2 & 3. Don’t worry if the cut surface of your beads look a bit scruffy…all they need is a quick rub with some sandpaper. I found it easier to lay the sandpaper on a flat surface and rub the bead along it. 4. Now drill a hole in the side of each bead using a small drill bit. Make sure you place a scrap piece of wood underneath. It’s not a good idea to get holes in the kitchen table! Once you have cut a number of beads simply string them onto a length of thread…job done! Tip: These little beads are also make lovely bracelets. If bright colours aren’t your thing then try some more subdued shades. White colored pencil beads look especially nice. 1. 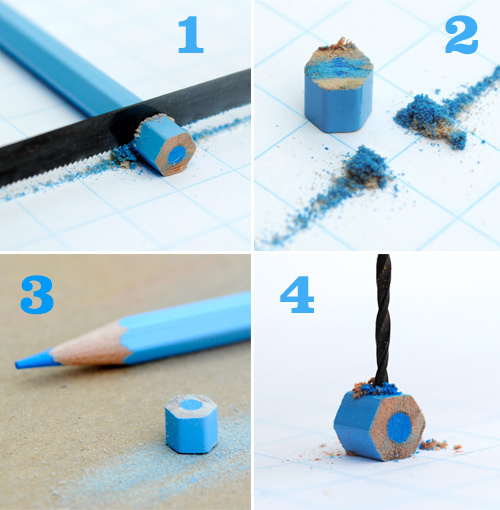 Begin by sharpening your colored pencil, then cut the end off as before. My beads measured about 3.5cm in length. 3. String the beads onto some thread. You can add some co-ordinating beads if you wish. If you fancy a bit more of a challenge then why not have a go at making the colored pencil brooch? 1. 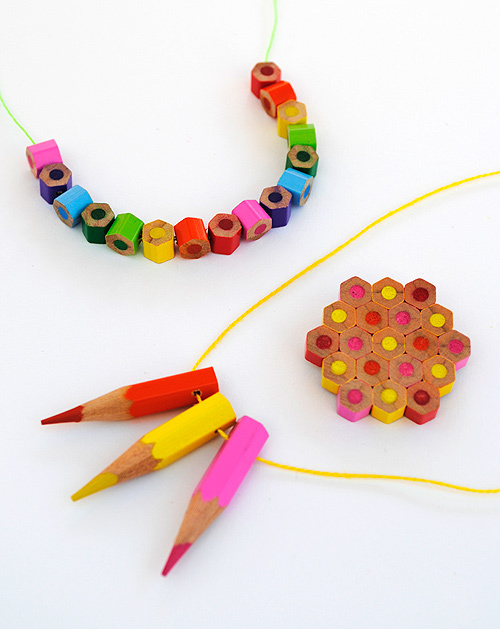 You will need to use hexagonal pencils for the brooch. Cut your beads as before. Mine were 6mm in length. You need 19 beads to make the brooch pictured. 2. Put some sandpaper on a flat surface and sand the beads so they are nice and smooth. 3. Work out how you want the beads to be arranged before you being gluing. Once you have decided simply start sticking the beads together using superglue. 4. Once your beads are all stuck together sand the underside of the brooch until it is flat and smooth. 5. Superglue a ‘brooch-back’ to the back of the brooch. Tip: The best way to avoid making a wonky brooch is to assemble it on a flat surface. The underside of the brooch will be the most even so make sure this becomes the front of the brooch. Make sure you only use the tiniest dab of superglue on each bead….and don’t stick your fingers together! I have done this before and was reminded how powerful superglue is! Finally, remember these necklaces are not recommended for under three’s. I would also avoid making the pointy bead necklace for any child…for obvious reasons. I love this….I hope to work on it this Summer and make A LANYARD for my school id…I think a tiny bit of clear nail polish on the ends would keep the colors from smearing on my clothes….I’ll try to send you a picture when I get it made…wish me luck! That’s so cool! I may have to give this one a try. this is so cool and pretty- My ten year old wants to try this! This is really unique and cool! And think of the different color combos and options… it would be so stylish in an all neutral pallet. Oh! That would be gorgeous. I LOVE this! Will definetely be trying this one. So pretty – I love everything Kate makes! I can imagine a really cool red pencil heart-shaped brooch for Valentines. How cute! What a great way to recycle old colored pencils. Most of us probably have a bag of these in our house just waiting for a new life. love this idea, but i think i’d skip the pointed one…they seem a little unsafe to me. I would really be concerned about color transfer to clothes without sealing w/lacquer or shellac or something. Looks great, tho. I absolutely adore this project and can’t wait to try it with my kiddos! My creative wheels are going haywire with all the possibilities! Thanks for sharing! What an adorable idea. Wouldn’t it be fun to adapt it to make holiday ornaments? What a nice present for a teacher that would make. Wow. This is so beautiful. I love this–thank you for sharing! I think the colored pencil beads would look even better and more like real jewelry if suspended from a fine necklace chain (maybe in a copper or silver color). I really love that idea. Sort of a high + low combo. Very cool. What a neat idea! I’m starting my Bachelor of Education program soon and will be specializing in Elementary education. I think this necklace would look so cute on an Elementary teacher! The kids would love it! What a cute idea…for adults, too! Hi Rebecca….yep, I wear mine more than the kids do!! I love this and was thinking how fun it would be… and then I was at the Dollar Tree today picking up some craft supplies for a project my kids and I are doing and they had the hexagonal colored pencils in bold colors!!! $1.00! Perhaps the least expensive FUN jewelry of all time if I can figure out how to use that drill!!! YAY! THANKS! 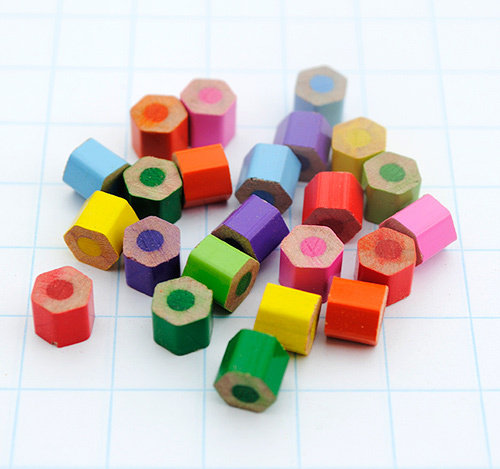 Do you remember which dollar store you found hexagon shaped pencils at? I’m in northern Virginia and haven’t been successful yet. Thanks! Just posted this to Pinterest — love! Wow, those are fun! …. fantabulous!! I would love to make one of these for my grandma…do you know if the pencil color rubs off on clothes? Good question, Lou. I don’t know the answer. But if you’re worried, I’ll bet coating the ends with clear acrylic paint (or nail polish) would do the trick. Well, I just found my “teacher Christmas gift”. Thank you!! Wow! A lovely idea, so simple and so unique! I am a teacher and plan to do this with the kids! I am going to start with marking the beads, drilling and then cutting off the beads. I’m not a great driller, so it seems safer for me this way. That seems so smart, Lilli! Great idea. Incredible and fantastic! Thanks for this idea. Does anyone sell the cut pencils already? So cute. Do check out etsy…I’ve seen a few people that sell crayon jewelry…you might be able to buy the ready cut beads from them. I see using lots of them and making a trivet. One thing I thought of: it would probably be considerably easier (and safer!) to drill the hole BEFORE chopping the piece off the end of the pencil :) just a thought! Hi Samatha…that sounds like a good idea…I never thought of it!! Do allow for an extra millimeter or two when marking out because you do lose a little when sanding. I love these, I’ve sent the link to a friend to have a go! this is so adorable! :) i love the necklace idea! Love the cool colorful idea..you have done it smartly! Love these! The brooch especially. So fun! Very cute – and clever! Wonderful tutorial, Kate! Love your blog, Gabrielle. Alas, our dollar tree didn’t have hex colored pencils. After an exhaustive online search, I found a lot of $$ artist-grade hex pencils, and one more affordable brand: Pentel. A 24 pack can be included with your next book purchase on Amazon for $4.99. Hi! Love the project and attempted this weekend. However, I got stuck at the drilling stage. I couldn’t figure out a way to keep the bead still while I drilled (the pencils were round). Does anyone have any tips to keeping round beads still while you drill? Is it easier with hexagon pencils? I tried setting the bead in play dough but had not luck. i have a suggestion for your for the round beads… i haven’t tried this myself, but i have an idea as to what you could try doing. 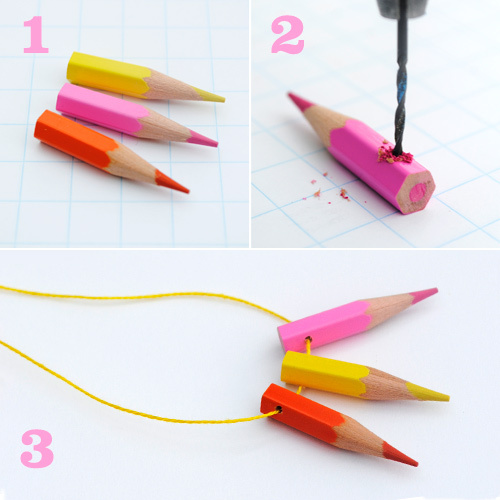 firstly, don’t cut the pencils into beads yet, it’s much safer to drill while the pencil is long (so you have more to hold onto). then, mark out where you want the hole to be, and take a nail and carefully press it into the pencil to make an indent. (that’s what i usually do in tech class to make sure the drill bit drills on point) then hold tight and drill carefully into the pencil..
We made colored pencil “value necklaces” for Young Women’s tonight thanks to your great idea. They turned out so cute and the girls loved them! What a great idea for gifts/stocking stuffers at Christmas or even in a gift bag at Birthday parties. I am a homeschool momma and I do believe I am going to try it on my own first (hide out in my room and try to keep the noise of the drill down-shouldn’t be hard over the noise of the TV or video games) then figure out how to present it to my son and get him to try it out. I feel a crafty kind of day coming on and gonna have some stocking stuffers to boot when we’re done. I can find some colored pencils at the $ store or at one of the discount stores nearby and have a lot of fun. Come to think of it, we may already have enough extra one at home that are kind of wore down to try out first before buying any. OOOHHH! I can’t hardly wait to get started. This is such a cute gift idea and to be able to use those old colored pencils without buying new ones makes this project a hit in my house! I can’t see the sharpened ends being unsafe for an older girl. If the ends got broken, well, that’s par for the course with those pencils. It’d just have a new look. lol I might actually drill the holes, put the beads in gift sacks for the girls to make their own necklace. Keep up the good work! I’m another one who hoards pencil stubs in the hope of finding something useful to make out of them. I love the idea of turning them into beads, even though I’m rubbish with a saw and drill! They’d also look good decorating a box or arranged into a mosaic picture. This is so cute and I want to make a couple for two little girls. But I haven’t been able to find the right type of colored pencils — the ones with the hexagon shape and has exterior color not just plain yellow on the outside. Could you recommend me a place or brand? You will find drilling the holes much easier if done before cutting the pencil to length. More to hold on to. Thanks so much…now I know how to make these great looking neckalces/bracelets. I am sooo excited…it’s worth buying a new set of colored pencils just to make these goodies! My hubby and daughter are making this right now. 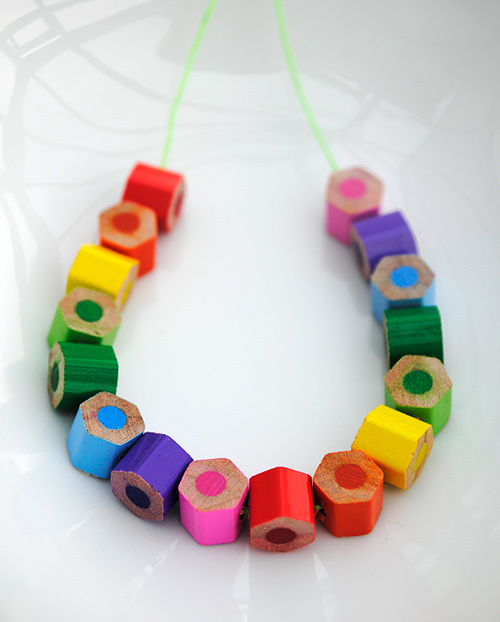 do the colored pencil necklaces rub off onto clothing at all? uauuu!!! That´s nice! I really love the jewlery made out of color pencils!. I´m going to try myself. Thank you! wonderful blog!!! Love this idea but we are having such a hard time getting a clean drill—without splitting the pencil or some if the paint chipping off. Any other tips??? Please help. It can’t be this difficult! Yours look so nice! I already had this problem sawing them : they splited or the paint came of at the outside … Maybe it depends on the kind of wood they used for the pencils ? I tried a lot, very gentil and carefully, but didn’t succeed. I absolutely love this project! I hope I can try it soon! I dont’ know…these are very “cute” but a lot of work to cut and then drill these itty bitty things. If you are used to doing jewelry it might work. Then again, I’m an art teacher and I would have liked to have the pencils to actually DRAW with for my kids. When they are no longer usable, maybe then I would consider drilling holes. I especially like the colored pencil necklace. This makes a perfect teacher gift. Just shared this fun tutorial on our blog and hopefully alot of people will pop over your way to see it! Thanks so much for sharing your fabulous ideas! So cute and creative!! You can see the post at http://www.nevernola.com! I think these will make great coasters! Quand la créativité se joint au recyclage, le résultat est étonnant…Bravo. J ‘aimerais partager votre idée sur mon blog , avec votre accord bien sûr . Wow…it’s really very beautiful made by pencil color…Awesome idea….! Fun ideas with colored pencils! Take a look at zincwhite.co.uk for some fun things they are doing with colored pencils too! Hi! This little project is great, so I linked it on my blog (http://freshtrash.blog.com/), hope u don’t mind! Feel free to stop by! what a good idea!!! my husband suggest me to drill the holes before making the beads…easier to do ….thank you ! Such a great idea! My daughter love it. Love this project – turn those used pencils from making art to being art! This is gonna stain your shirt, unless you spray it with a clear protectant coat of some sort. Hi, love your ideas and I saw that someone else experienced the same problem as i did and that is of the smearing of the colour inside when you saw the pencil. How is it possible that your cuts are so clean. Will you share your secret? Having this same problem. Sandpaper only smeared it worse. Did you find a solution?